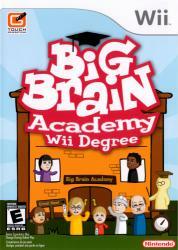 Welcome to Big Brain Academy, the only school where you can school your friends and family! How big is your brain? Find out as you test yourself with numerous lightning-fast activities like across several categories. When you enroll, headmaster Professor Lobe will introduce you to Test mode, challenging you with a bevy of hilarous and exciting brain-teasers. Then, when it's all over, the professor will calculate your brain weight, award you with a grade, and give you an idea of what career track is best suited for your brain weight. Don't worry, it's all in the spirit of fun!